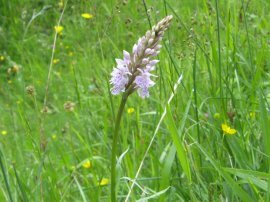 I did this walk on Saturday 31st May. 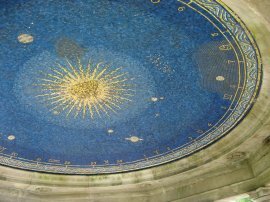 I got up early, taking the tube to Victoria and then catching 7:33am train from Victoria to Dorking, although the train ended up leaving about 15 minutes late. 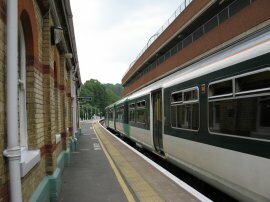 A single ticket to Dorking cost £8.50. Whilst it is possible to take a reasonably quick train journey between Merthsam and Dorking which is what I had done the last time I had walked this stretch of the North Downs Way this stretch was actually quite short and thus this time around it was my intention to push on to Caterham. This would have meant a very long train journey back to the start point in Dorking and thus it was easier to travel in both directions by train, the only draw back being the need to by two separate single tickets as the train routes are on completely different lines which rather increases the price for the trip. The day had started quite bright and sunny and very still with almost no breeze whatsoever. On the way down to Dorking I had spotted six foxes sunning themselves at various places on the railway embankments besides the track, another sign of how widespread and used to the urban environment they have become. I bought a croissant from the shop at Dorking station for breakfast, set my GPS, and walked the half mile up the A24 to rejoin the route of the North Downs Way by the Stepping Stones Car Park. The last time I had been at the stepping stones across the River Mole, photo 1, a few weeks ago they had been blocked by a huge fallen tree. 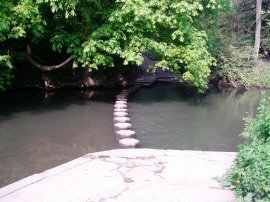 This had now been removed but one or two of the stepping stones also appeared to be missing and thus it was still not possible to use them to cross the river and I had to take the alternative route of the bridge a short distance downstream. 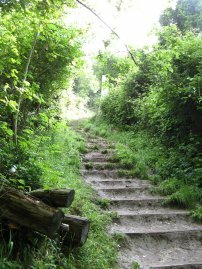 Having crossed over the stepping stones bridge it was time to start my ascent along the broad and rather muddy path up Boxhill, photo 2. 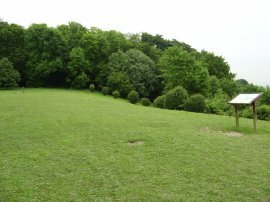 A steep half mile climb later I was passing the trig point on the top of Boxhill, photo3 , and making my way along the path that runs just inside the trees along the top of the hill. 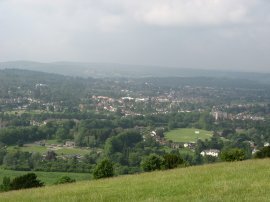 From the top of the hill there were good views over Dorking, photo 4, and the surrounding countryside. 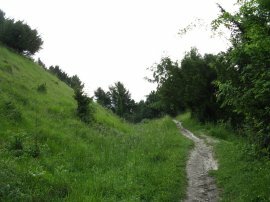 The path continues along near the top of the hill, at one point heading steeply down a flight of wooden backed steps built into the hillside before immediately turning sharp left and heading just as steeply back uphill along a broad chalky path that runs between the trees. 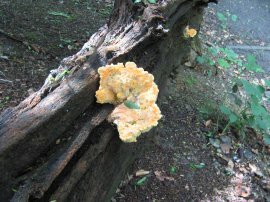 There are a lot of yew trees growing on the hillside and a number of the dead branches had a large yelow fungus growing on them, photo 5. After a while the route enters into an area that surrounds the old Brockham Limeworks, gradually descending down through the trees along a chalky path, photo 6. 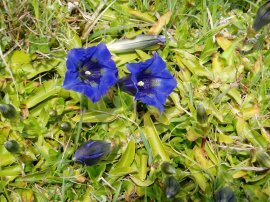 There were a number of nice flowers growing in the chalky soil besides the path including the flower in photo 7. 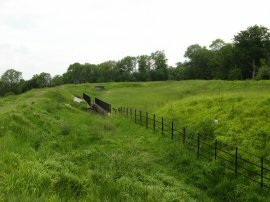 Having past the remains of the old limeworks, photo 8, and heading alongside an area where quarrying was still active the North Downs Way joins a track that runs past houses into the village of Betchworth. Here the route heads left along Pebble Hill Road. 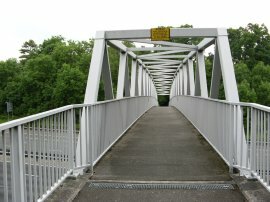 The route heads along the pavement before taking a path that runs off to the left, just above the road. Where this ends the North Downs Way crosses the road and continues ahead for a short distance before turning onto a path the runs between trees, besides the last house on the right. 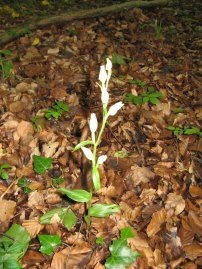 Along this section of path I spotted a number of White Helleborine flowers under the trees, photo 9. Reaching the end of the trees the route turns left along a small hedge lined path that runs gently uphill between fields, photo 10, back towards the top of the downs. 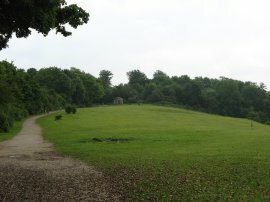 The route then turns to the right, along a path running through trees, just above the fields. 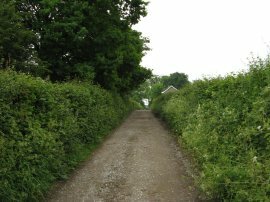 The route then heads up to join a public byway for a short distance before turning off to the left, again taking a footpath that runs just inside the tree line above the fields to the right of the path. With the nature of the path with the trees either side it meant, as with much of the North Downs Way so far, the actual views were rather limited. 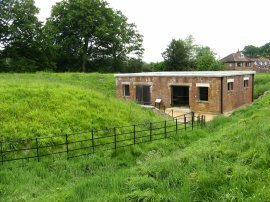 The route reaches Juniper Hill and continues ahead to a bridleway way where the North Downs Way heads off to the left, climbing up hill along the second very steep ascent of the day as the path makes its way back up to the very top of the hill. At this point the weather had clouded over but there was still absolutely no wind and it was very warm and humid on the way up the hill. Reaching the top the route turns right and then right again to run along a fairly broad bridleway close to the top of the hill and passing a couple of old Coal Posts, photo 11. Reaching the top of the hill I could hear the sound of the traffic on the M25 which, although hidden by the trees, was running very close to my left, making a constant roar in the background. A sound that was to accompany the walk, on and off, for most of the day. The path soon passes the open space on top of Colley Hill where, for a short distance, there were good views off to the right towards the town of Reigate in the valley below and on to the Greensand Ridge, further away on the horizon. 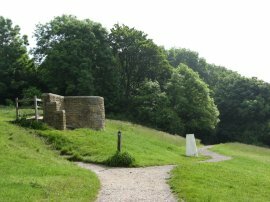 At the top of Colley Hill the North Downs Way passes the Inglis Folly, photo's 13 and 14. 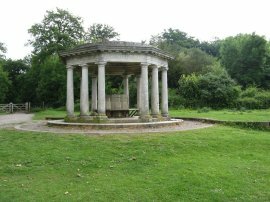 The Inglis Folly was donated by Lieutenant Colonel Inglis in 1909. 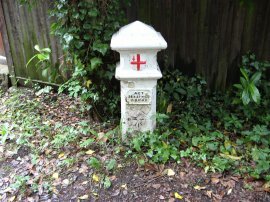 It was originally a drinking fountain but now houses a direction indicator. A little further on the route passes a tall brick water tower hidden amongst the trees. 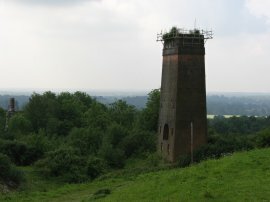 The route goes over the top of Reigate Hill, past an extremely tall telecommunications tower and a shorter white water tower, before passing the grounds of Reigate Fort, photo 15. Last time I had been past here the fort had been closed for restoration work but this time it was now open and I took the opportunity to have a little look round the grounds of the National Trust property. 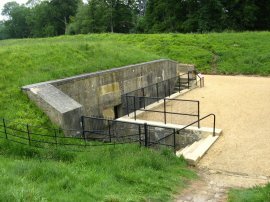 Reigate Fort, photo's 16 and 17, was one of 13 mobilisation centres built in the 1890s to protect London from invasion, although none of them ever saw action. Leaving the for the route heads briefly along a stretch of tarmac before continuing ahead along another bridleway the gradually descends down to cross a bridge over the A217 and the heads through car park for Gatton Park. The path then makes its way steadily downhill through the grounds of Gatton Park, along a rather non-descript path running through trees. Reaching a driveway by a house the route turns to the right, still continuing to head downhill. 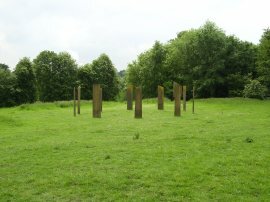 The route heads down this driveway towards the grounds of the Royal Alexandra and Albert school, on the way passing the Millennium Stones, photo 18, which were placed at Gatton Park on the route of the Pilgrims Way. The stones, made from Caithness Flagstones quarried in the far North of Scotland were designed by Richard Kindersley. 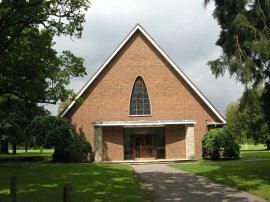 The route continues through the fine school grounds for some distance, passing by the impressive chapel, photo 19, before leaving to join a road for a few hundred yards. The path leaves this road along a rather dingy footpath that runs off to the left heading gently downhill between trees by Whitehall Farm. This path leads into the grounds of Reigate Hill Golf Course, photo 20, the route running quite close to the rather noisy M25 once again. In the distance ahead I could see Merthsam and a bit further on the M23, both motorways that I would soon be crossing. 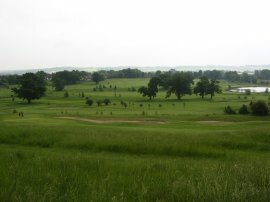 Leaving the golf course the route heads besides the grounds of Merthsam cricket club and on to reach a road on the edge of the town where the route turns to the left for a short distance along a pleasant street before turning right along a footpath that leads to a bridge over the M25, photo 21. and for the first time since Guidlford I was walking along a stretch of path I had not walked before. 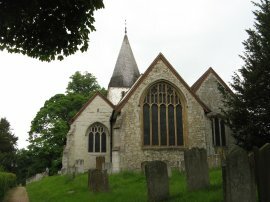 The route continues ahead across a minor road and through the grounds of the charming St Katherine's church, photo 22, although it was rather difficult to get a decent photo. Leaving the churchyard the route turns right along London Road North and then left up Rockshaw Road. The route follows the road, crossing high over two sets of railway lines in quick succession, and continues ahead passing a number of fine house for some distance before eventually taking a footpath that runs off to the left over open ground almost opposite a house called Orchards End. This footpath runs down to take a tunnel that runs under the M23. Once under the motorway the North Downs Way once again starts heading back uphill towards the top of the hills, photo 23, this time over more open ground than the woodland of earlier on in the walk. 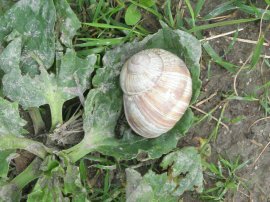 As I was heading up the hill I spotted a Roman snail on the path, photo 24. I also decided it was time to stop and eat my lunch. 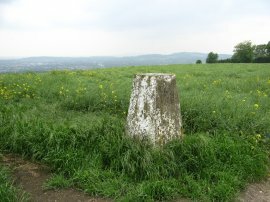 Reaching the top of Ockley Hill the North Downs Way turns to the right along a tracklined by tall hedges that runs between fields, passing a trig point in a field to the right, photo 25. 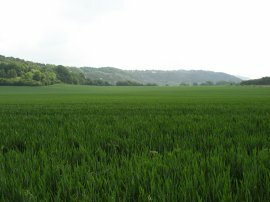 The North Downs Way crosses a road near Chaldon and continues ahead along a gravel track, first running past houses and then between fields lined with trees and another tall hedge, photo 26, that rather limited the views. 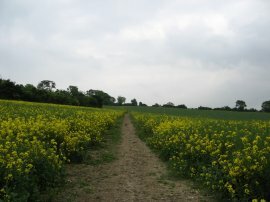 Eventually the path runs besides fields with more open views as the route heads past Willey Park Farm before heading round to the right to cross Stanstead Road and continues ahead into War Coppice Road. To the right of the road there was a strange abandonded brick tower. At Hextalls Lane the route bears off to the right along a footpath on the right running through the tree top rejoin the road, now called Tupwood Scrubbs Road, by the Caterham Viewpoint, photo 27, which is where I finished my walk along the North Downs Way for the day. At this point the GPS said 13.4 miles which meant I had done another 12.9 miles along the North Downs Way. Leaving the viewpoint I headed down a rather muddy bridleway that runs downhill through Tupwood Scrubs to join a broader track at Upper Harestone. I followed this track as it made its way through the trees to join the tarmac road of Harestone Hill which I was able to follow almost all the way down to the train station at Caterham, photo 28, where I commenced my journey back to Walthamstow. I only had a very short wait for the train and the single ticket cost £4.90 which I thought was quite reasonable. Reaching the station I had walked a total of 14.8 miles. The above three photos were taken when I had last walked this stage of the North Downs Way back in April 2005. 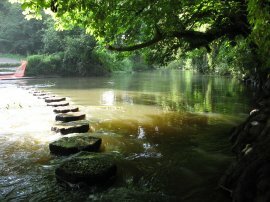 Photo 29 shows the stepping stones across the River Mole in slightly better condition that they are now. 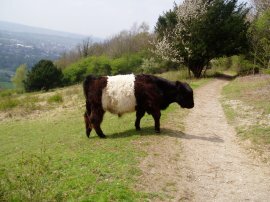 Photo 30 is of a Belted Galloway cow crossing the path close to the top of the Boxhill and photo 31 is of some Trumpet Gentians that were in flower at the time.